Denyse, I owe you a lunch. It is the custom here at Bevboy's Blog to take my interview subjects out to lunch as I ask away. But Denyse Sibley beat me to it. She was running a few minutes early; and I, a few minutes late. She was already waiting for me at the lunch place in downtown Halifax that we chose. She told me how good the clubhouse sandwiches were, so I ordered one. This is the first time I have spoken to someone who appears on a tv commercial, or who is on a billboard. I feel extra special. We began to talk. A lot. Denyse Sibley: Radio/TV broadcasting, which is offered at the NSCC [Nova Scotia Community College]. When I took it, it was Kings Tech in the [Annapolis] Valley. Bevboy: In Kentville. Did Dave Bannerman teach that? DS: Dave didn't teach me. He was working in the Valley in radio when I took the course. He was ahead of me. He took the same course. It was a year long when I took it. It's now two years. That was the start. I went out on work experience at 96 CHNS. Mike Cranston was the program director, and offered me a part-time job which led to a full-time job in Halifax. That was on Tobin Street. BB: Maritime Broadcasting or whatever it was called back then, left Tobin Street around '87, '88. DS: I don't know for sure. We moved from Tobin Street to Morris Street, and from Morris Street to Sackville Street which is where we've been for the last while. When I worked for them on Tobin Street, I do believe it was owned by Maclean Hunter, if I'm not mistaken. So, that was a while ago. BB: Tell me about that building on Tobin Street. I remember the building existed after you guys moved to 1313 Barrington Street [at Morris]. It was Maritime Business College or something. DS: And then they tore it down. BB: [That space] is an apartment building now. DS: It was a big old buildling, [with] two floors. 96 CHNS on the top. Country 101 (as it was called at that time) on the bottom. I worked specifically for 96 CHNS. I did an all night shift. I actually operated a talk show for John Gilbert out of Toronto. That was from midnight until five. From five to six I was live until Mike Cranston took over as the morning man. So, that's where I started: On an all-night gig in Halifax. BB: That goes back a couple of years. 2. What is your best piece of professional advice? DS: Never be afraid of hard work. BB: All right. Who told you that? DS: I grew up on a farm. Your days are very long. You sleep very little. Early to bed; early to rise. That's been our motto. Many hands make light work. I am a farm girl. BB: Are you from Nova Scotia? DS: Yep. Born and raised in Nova Scotia. I have never lived outside of Nova Scotia. I have always lived in the Musquodoboit Valley. I grew up in Meagher's Grant, and I now live in Chaswood, which is all in the Musquodoboit Valley. It's in the HRM, which is huge. It would have been the former Halifax County, but now it's part of the amalgamation. 3. Who were your influences in radio when you were growing up? 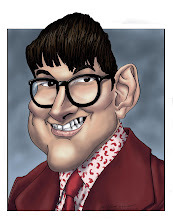 DS: Actually, growing up as a kid, I would have to say none, until I got involved in radio, studying it. And that's when I would have to say Brian Phillips. DS: I looked at him with awe, and, sort of, envy. That really was it because when I was picking a career I didn't think that was the direction I was going to go in. It wasn't like every day in my life I wanted to be in radio. I didn't think about it all until I was in Grade 12. I was trying to decide what I was going to do for a career. I applied to a couple of universities. I was spending time with the guidance cou ncillor and said, "Ok, help me. What am I gonna do?" His name was Mr. Poole, who said, "Well, you can do anything you want to do." I said, "Well, you can do anything you want to do, but what am I going to do?" He said, "Well, what are you good at?" At that point, you think you're good at nothing. Scholastically, I did very well. I was a good student. I made good marks, so I would certainly not rule out any university. So, he came to me a couple of weeks later and said, "I found this really neat thing. I think it suits you." BB: Oh, uh, ABI. The Atlantic Broadcast Institute. DS: Maybe the predecessor to that? BB: The Atlantic Media Institute? DS: Something like that, yeah. I think it [the course] was six months or something, but you had to be older than I was; I think you had to wait a year. I wanted to do something right away. He mentioned a couple of universities out of province. Didn't really want to do that. So, then he found this course at Kings Tech. The other choice I had was to join the RCMP, which I was considering as well, but again, you had to be 19, and I didn't want to wait. I went and got the paper work from [Kings Tech] and found out I had to audition. I thought, "Oh, this is tough! Will I be able to do this?" I was just throwing around ideas [of what I wanted to do]. I applied. I was asked to come in for an audition. There were a ton of people applying. They only picked 17, and I was one of the 17. It was really tough to get into. I was shocked. When you auditioned, you had to read this huge newscast in front of a tv camera, which you had never done before. When you first applied, you put it on cassette tape and sent it to them, so they would decide whether they would contact you back. I passed that part of it. Then, I had to go down for this audition down in the Valley. I thought, "Man, I'll never do this!" Again, I just didn't know what I wanted to do in life. I'm just feeling things out. I went to the audition. There was an interview afterwards. Mr. Curren and Mr. French, who were my instructors when I eventually went, interviewed me. I remember Mr. French asking me, "What makes you think you want to do this?" I said, "Well, I don't really know if I do want to do this! It is just one of my options." I said, "I like to talk. I'm a communicator, so I think maybe I could do this. " So, maybe four weeks later, I got a letter in the mail that said I'd been accepted. I said, "Well, I really have to think: Am I going to do this?" I talked to my mom and dad about it. My father said, "Well, of course you're gonna do it! If you got accepted, that's where you should be going. That's your path in life. " I said, "Well, I don't know if I want to do this." I grew up on a farm. I thought I could take over the family farm. I had all these dreams. My father said, "No." He said, "You're gonna go, and you're going to be the best damned radio announcer ever." I decided I would go. I lived in the Valley for a year, and went to school there. BB: I'm from the Valley. You stayed in Kentville? DS: Kentville. On Belcher Street, Mrs. Jess, who was a school teacher; the lady I boarded with. BB: Where did she teach? DS: She's not alive anymore, but I think she was an English teacher. Her son and daughter had a farm right across the road. It was an apple farm. DS: Yes! [Jimmie] was her son. So, when you come away from the school and come up Belcher Street , they were on the right, and she was on the left: The big old farm house. BB: I'm from about a mile from there. DS: Oh, wow! What a small world. BB: I'm from Port Williams. DS: We were there all the time. We used to take the Port Williams exit [Highway 101] to come to her house. 4. What was it like to leave FX101.9, and what was it like to return? DS: I was very excited to leave. I was looking forward to a brand-new opportunity. Where I was in Halifax, I was always considered a co-host. It was always supposed to be an equal man-woman team. But I never, ever felt it was equal, even though it was never something I would ever dispute with anybody or give anybody a hard time over. But this opportunity came up, and that would be my show. When I sat down in talks with the group from Astral, they made it clear that if I were to take that job, they would strip the show, and I would put it back together. I really welcomed that opportunity. I remember saying to Chris Van Tassel, who is the program director [at Astral], "So, this will be my show? I'll get to say, do [whatever I want]? It will be my innovative approach? " He goes, "Your show, 100%." It wasn't as though there was an offer on the table in the first meeting, but Chris Van Tassel and Mike Worsley (the sales manager, and Mike was a friend of mine for many years) and I sat down to talks. I thought, "This is great. This will be my gig." I wouldn't exactly have a co-host, but the newsman would interact with me at my request. So, I would control that. There were certain times when he would come on definitely, but I could have him on all I wanted as long as he was free to interact with me. I thought, "This is pretty good." I was really happy. I'd known for several weeks that I would be leaving [MBS]. I knew and I gave my two week's notice. I was really happy to go, and I was excited to start the new opportunity, and I looked forward to a half hour commute versus an hour commute. BB: Yes, because [Truro's] closer to your home. DS: Yes, it's much closer to my home. I knew some people in Truro because I am a member of the Debert Flying Club. I had friends who live in Truro. I had worked there for a short time in my earlier radio days, back when it was CKCL, before it was Cat Country. So, I was really excited, and I went in very proudly. I went in and thanked the current program director, which was Allan Gyddick, for his guidance, and his help. I left with a smile. I left politely. I shook hands, and went on my way. DS: That was leaving. Coming back was a much, much tougher decision for me. Unbelievably tough, to the point where I was in tears trying to make up my mind. No tears on the departure [of FX101.9]. There was excitement. The half hour commute was really appealing. And the audience in Truro embraced me very well. They were very accepting of me. You were in a secondary market. It is almost like you were this princess or something. You would do a remote in a store in Truro like Canadian Tire or something, and you'd fill the parking lot. Whereas here, you have so much more competition in Halifax. So, on the return, which was a shock, because I'd already been gone for about six months, with no interaction, no correspondence. When I departed [MBS], no one said anything to me. I gave them my two weeks' notice. I said, "I can be here for two weeks, or I can pack my stuff and leave today. It's entirely up to you guys. Whatever makes you happy." I worked my two weeks. BB: Did you say goodbye to your listeners on that final day? DS: Yes. On the final day, we did a goodbye show. We had people call up and wish me well. We couldn't say where I was going. Bill Hart was working with me at that time, and he said, "Denyse is retiring". That had people thinking, "What? She's retiring. That's weird!" But a lot of people called in and wished me well. They were really nice. Some people missed the goodbye show and never knew what happened to me. So, about six months later, I was contacted by Maritime Broadcasting, July of 2008. I was at my house, outside, mowing the lawn or something. I came in and had a message from Scott Clements. He identified himself as the Director of Programming for Maritime Broadcasting System. I knew that somebody had taken that job, but I really wasn't familiar with who. When I left MBS, I cut the apron strings. That was behind me. I was starting a new challenge, and I was giving them 200%. They no longer had my attention. In order to get the new call letters straight in my head, [FX101.9] had to go off; [Cat Country] had to go on. You couldn't listen to somebody who was doing what you used to do. This was my new life. So, I had this message from Scott that he wanted to speak with me, if I wouldn't mind giving him a few minutes of my time. I met him at the Stewiacke Tim Hortons that night. We ended up staying there for a couple of hours. I had to work the next day in Truro, and I was in there at 4 every day. BB: I hope he paid! DS: [Chuckles]. Yes. It was only green tea. It was nothing too extravagant. We had a meeting. He just wanted to know why I left. He said, "I have heard this version of the story, this version, this version of the story. I decided I was going to go right to the person who can tell me the truth." I told him, nicely. There were some issues. The biggest issue for me was money, and probably slightly a lack of respect, which sort of ties into money. Did I think anybody kicked and booted me around? No. BB: We are on the record, you know. DS: That's fine. That's ok. I'm not worried about that. It's not derogatory. It's just the way it was. At the end of the interview, he asked me if I wanted to return. I said, "Why would I want to do that?" He said, "Because Halifax is where you belong. That's your home." I said, "So, you think I would like to drive an hour again over half an hour? I'll think about it." He said, "Let's meet again in a couple of weeks." A week later we met again. Same spot. The weekend of the Eagles concert, we met a few more times. Our final meeting was on the holiday Monday [the long weekend in August] , I signed the deal, very nervously. It was good for me. The next day, Tuesday, I had to go in to work in Truro, knowing that I needed to give them two weeks' notice because Halifax needed me ASAP. There was no hedging around. Ratings start September 1st. Tuesday was a really tough day for me, because the first thing I needed to do was speak with Chris Van Tassel, whom I adored. I went over it in my head. All morning it distracted me from working. I did my best, but it was like, "This is going to be so hard for me. ", because I just didn't really want to go. I felt genuinely very bad. I did what I had to do that day, and I got out of there quickly. I went to see Mike about it, and he was really hurt. He hugged me. "Just get out of here", he said. "I can't handle this." He was just genuinely sad. So, I finished out the week. I left. I said goodbye to everybody, and I cried. I didn't think that I would cry. They were really sad, too. The one thing I wanted them to realize was that it wasn't them, and that I didn't think they were bad people. I wasn't leaving for any of those reasons. My description to Mike was, "I felt like I was leaving a relationship, and I was still in love." Sometimes you can't stay with somebody for whatever reason. Either the parents don't accept you, or somebody's kids don't accept you, or whatever it is. I said, "I just feel like I'm leaving even though I'm still in love." I just needed them to know that. Chris was really good about it. He took me in his office and said, "Don't worry about it. I understand. If I was in your position, I know I would have done the same thing. I just want to make sure that you're treated well. You're always welcome here. You're a friend. But just don't tell anybody that we're assholes!" I said, "I would never do that!" He said, "That's good. That's all I wanted to know." DS: That's ok. That's what he said. I really thought I'd be there forever. That was my intention. I had my house unofficially up for sale. I had a lot of land I had my eye on Stewiacke. I thought, "I'm going to sell my house. I'm going to build a smaller onne. I'm going to be 15 minutes from work, and live right in a town instead of a little community. I'm going to have a Tim Hortons in my back yard. I had all of these plans. That was my focus. So, I never really thought I'd be going back to Halifax. No one was more shocked than me when they came to me. And, to go back, I was excited. Scott was a great guy. He had big plans. He promised certain things, and it all seemed like they were going into place. One of those things was promotion. They had promoted me better than they have ever promoted anybody on that radio station. That was one of the things, because I can't do this on my own. You want me to build numbers? People have to know that I'm here. People have to know that there's a morning show that's worth listening to that's country (or, hopefully worth listening to!). The option is there. People have to know that the one that left, came back, if that made any difference to anybody, and they obviously think that it would. Once again, I have to turn off Cat Country and turn on FX. Suddenly, in my sleep, I'm going, "FX 101.9. It's not Cat Country any more." I did it. I came back. I can honestly say I haven't had any regrets. My only regret is my personal regret for leaving a company that I really liked, and leaving people I really liked. BB: It's always hard to do. DS: It is, when you don't have anything bad to say. And then I felt, "Am I just greedy?" And then I thought, "No, because anybody would do what I did. BB: If it's any consolation, I have changed jobs a few times in my life, and left jobs for good reasons, but I left behind some really nice people. DS: I know. My conscience was beating me up inside. "I'm just being a greedy, selfish woman." But at the same time I have to look out for myself. I'm not getting any younger. BB: You're, what, 25, 26? 5. Ian Robinson tells me he has a nick name for you. Please tell me what it is, and do you have one for him that you want to share with the world? DS: [laughter] He always writes "38C" on my e-mails. And that's pretty self-explanatory. BB: I ain't going down that road. DS: [laughter] And, do I have a nickname for him? No. He's just Ian. I don't think any of us have a nickname for Ian. He's just a great guy. BB: He is a really nice man, yes. DS: He is a very nice man, and I will never regret the day he came into my life. He is a good person. I always worked well with Ian. And I was really sorry to see him leave FX when he did. Really sorry. I felt like I'd lost a best friend. But, I guess I didn't because I still see him and still keep in touch with him. We all got together for the Eagles weekend, Tony [Smith] and Ian and Gillian [Foote] who used to work with us, and we all had different call letters on our jackets. At that time, mine was "Cat Country", but the next week it switched back to FX. They laughed and made fun of me for that. They said, "You traitor! You're a Cat Country in this picture, but next week you're gonna be FX!" BB: Do you wear a Cat Country shirt when you're mowing the lawn, or painting? DS: You know what? I still have them. When I left FX, I gave everything away. I went to Cat, and I started getting new clothes. But, I still actually have some of them. But, it's tough to wear because I respect whoever I work for, so I gave a couple of them to my daughter. The Cat Country coat I offered to give back to them because I thought they might need it for an employee. But they said, "No. Just keep it". And we still have Cat Country hats and stuff. BB: It's a nice logo. DS: Yeah. And it's a nice radio station. It really is. 6. What is the difference between Country 101 and FX101.9? DS: I'll explain it to you the way I think it is supposed to mean. I'm not saying this is gospel. DS: When we made the switch from Country 101 to FX 101.9, maybe you recall, for one month we did Christmas 101 as the transition. DS: I think the analogy behind it, the thought behind this, is: There are people out there who listen to country but don't always want to admit to it. It's a different genre of music. I still to this day deal with people who will say to me, "Oh, yeah. Hillbillies, wife beaters, that sort of stuff, listen to country". I don't agree with that, because I think that I'm a good person. I don't break the law. I don't run around with a still in my truck. [chuckles] But, there's some sort of stereotype with the word "country". I think [MBS management's] idea was, sort of like XL 96 in Moncton (which doesn't say "Country" in the name; it does later on in the sell line). I think the thought behind it is to have people switch over to FX 101.9 just because it's another radio station. It's Q104. It's FX 101.9. It's Kool. It doesn't say the genre of music. I'm thinking their thoughts are, "Oh, 101.9. Let's listen to that." And you hear a song you like, and maybe it's Faith Hill, which is played on different stations. So, maybe, when they're listening to Faith Hill, and then they hear one of us do something that entertains them, they might just stay. And, then, all of a sudden they might realize, "Oh, I do like that music." I think, maybe, that's what they were thinking. It's not to fool the listener, but maybe broaden their horizons so that you're not stereotyped. Because, whenever you say, "Country 101", you're branded. When someone asks me who I work for, and I say, "FX 101.9, which is Maritime Broadcasting." "So, what kind of music do you play? ", they'll ask. You could actually maybe hook them to listen to you before they know what kind of music [we play]. BB: Do the letters "FX" stand for anything in particular? DS: I think "FX" comes from CHFX [the station's official call letters] And then the FX works out quite nice, because they got a lot of play on those two letters. It's the "FX" of summer. Feel the "FX" of country. So, they played on those letters a little bit. BB: Going back a little bit to where you mentioned the stereotypes associated with people who listen to country: When I think about what happened to the Dixie Chicks, about five years ago, that would almost reinforce people's stereotypes. BB: I'm just wondering if what happened with the Dixie Chicks around 2003, did that reinforce people's stereotypes? DS: I would say so. I look at my boyfriend, for instance, who thought that was horrible, how people treated the Dixie Chicks. "That's just redneck country thinking". I saw that negativity coming from him, whereas I thought, "Well, shouldn't the Dixie Chicks just have not said something so nasty?" But, when I sat down and watched their documentary [Shut Up and Sing], granted it was more favourable to them, I realized I was being more like Toby Keith. I was being more narrow minded. Really, what they said, they kind of said in passing, and they didn't mean for it to get [out there]. And I see it in this business. When you say something, and you say it on the air, and it's a completely innocent comment, and someone took that the wrong way. Not everybody, but somebody, and I think that's what happened with the Dixie Chicks. So, yeah, I think there was a little narrowmindedness in there, definitely. 7. You appear in a tv commercial for FX 101.9, extolling the virtues of Halifax. It is a fun commercial. How much work was involved in its production? DS: I would have to say, a lot of work for behind-the-scenes [people] more so than me. As in, my director of programming, my promotions people, the producers of the actual commercial, the production people. They had a lot more work than I did. I just had to smile and be happy [chuckles]. And do what everybody told me to do. It was a long day. We did all the filming in one day. It was difficult to do because it kept getting put off. It was supposed to start when I started back in Halifax; I actually started on August 18th. We wanted that commercial running as soon as I got back to let people know I was back, and we kept running into snags with the weather. Couldn't do the ferry when the weather was bad. Couldn't do the Public Gardens when the weather was bad. And then, when we finally got everything in place (I say "we" as in the company), what they wanted and the production people understood what they wanted the message were on the same page, we couldn't get the weather. If you remember the summer, it would just be raining. And then we had to get permission to be on the ferry. We had to get permission for this. We had to get permission to stand in front of Mills [Brothers] and look at the shoes. You needed permission to do anything. I remember being on the ferry. The captain comes down and goes, "What are you doing here?" [I said] "Talk to them." They had to dig out the paperwork from where ever they got the permission from. I suppose that would be Metro Transit? BB: I suppose so, yes. DS: When we got down to the deadline, they said, "Let's do it tomorrow. The weather's good". [Someone said] "We don't have the permission slips signed. Then, we had to go back to the studio and do a cut. After the whole thing was done, then I had to go back in like on a music video and voice it the same way I voiced it [outside]. I said everything I was supposed to say, but when they decided on what cuts they were taking, then they had to play that in my ear and I was in another studio without seeing it, and I had to copy the same inflection so that my lips would move the same way. That must be really difficult when you're doing a whole song! I'm thinking, "Man, I'm just like Beyonce here!" DS: It is, but that's the whole point. We want people to know this is where I am. I'm back here. This is a great place to be. I'm happy to be here. And at the same time let people know that we're local. BB: And, ironically enough, it doesn't even run on the local channels. It runs on the specialty channels. DS: It doesn't. It's on CNN [and other channels]. I had a gentleman write me an e-mail from Pictou [County], New Glasgow. He was really upset with me. Who are you going to contact when you're upset over Denyse's commercial? Denyse! You don't know who else to contact. Not knowing I would have nothing to do with it, I guess. Anyway, he was really unhappy that when he is sitting and watching CNN, he has to watch me. He said, "I just take my remote and I just turn the channel." He said it was an awful way to watch tv. "I don't want to see your commerical. I have a local radio station." So, being me, I thought, "OK. I'm just going to explain this to you, buster." I never let anybody shoot me down without an explanation. You can hate me forever, but I'm going to tell you why something is the way it is, why I was put in that position. I said to him, "As you may realize, I had no say in what networks [the commercial] goes on. I had no say in the actual production. I did what I was told [to do], and it was bought on 7 networks through Eastlink cable. You obviously have Eastlink." DS: Sweden, or in Germany itself. You can listen to my radio show. So the fact that you have a local radio station is irrelevant." And, I said, "Tell me, please, if you change the channel when Portland Street Honda [which is in Dartmouth] has a commercial, because you're not going to buy a car from Portland Street Honda necessarily. You're probably going to buy from your dealer in New Glasgow. So, does that offend you? " Because he was very offended by the fact that the Halifax market had intruded on him. BB: Oh, it wasn't you personally? DS: No. It wasn't me personally. I also said to him, "You may have noticed, C100 runs a commercial at the same time. They were all running in a rotation, so you might see mine. Then you'd see KOOL. Then you'd see Q. You seem very upset. I'm sorry you feel that way. But I have no control over it. This is what their goal is." He wrote back, and I just opened a can of worms. He went nuts on me. "I don't like watching you. I don't like watching Q104. I have a local radio station, and because of you I'm canceling my Eastlink." So, to me, there is a narrow-minded gentleman. He obviously doesn't realize how cable tv works, how Eastlink works. Just because you've bought Eastlink, doesn't mean you're not going to get a Halifax commercial. My commercial plays in New Brunswick. My friends and relatives see it in New Brunswick. Anywhere you can get Eastlink, you can get [the commercial]. BB: So, they don't substitute local commercials? DS: For instance, if they were watching the local news broadcast at my boyfriend's mom's, they will probably not see my commercial there, but if they're watching CNN they might see it. Or if they watched [A&E]. BB: It's a little disappointing that I can't see that commercial locally. DS: I think it's the way they buy, Eastlink. It's not on ATV. It's not on CBC. It's not on Global. But anybody who's got Eastlink cable will see it on some network. I think they said they bought 8 [networks]. It got lots of exposure, but my mom and dad live in Meagher's Grant, with CBC, Global and ATV. They never see the commercial, because it's not on the local channels. BB: Well, don't take this the wrong way, but if there's a choice between watching you and that fat guy on the Q104 commercial, I'll choose you any time. DS: Thank you! I haven't seen the Q104 commercial so I can't speak about it. DS: That's what the guy in this e-mail said. He obviously had a gripe about radio station commercials. I think mine's well done. I'm super critical of it, because it's me. But when you sit down and listen to your own work, and you watch yourself, it's like, "Oh, my God! I have so many wrinkles! Why did I wear my hair that way?" Because that's what women do, right? I find it really hard. And I don't see it in my house because we have satellite, but if I am visiting someone and it's playing, whoever's there makes you watch it. I find that really embarrassing. It's like listening to a voice-tracked show, and you're driving along in the car and all of a sudden it's you on the radio, and it's like, "Turn that off." Maybe I just don't have the confidence to sit and watch that kind of stuff. DS: The Country Breakfast Side Dish. BB: That's voice tracked, I presume. DS: It's voice-tracked. We want it to sound as live as possible. I find that really hard to listen to, but they make me listen to that because it gives me an opportunity to listen to my work when it's sort of live. It wasn't my idea to do that [half hour]. That was Scott's. Apparently a lot of radio stations in the U.S. do that. I personally feel that it's radio's goal to get as much out of you as they can. I don't mind that because I love what I do. It doesn't bother me if they ask for extra from me. It's their goal with that to introduce us to the afternoon people who don't get up early , "This is what our morning show sounds like. Here's a little taste of it." I see why they do it. BB: So, when you finish your shift at 10 o'clock, that's when you do the voice tracking for the 5:30 half hour. DS: Yes. When I prep for my morning show, I always set some stuff aside that I may use in the afternoon, because it can't be repeated. On the weekend, we have a "Best of" show, where we take clips and play over, but this is all fresh, new material. So, more often than not, I'll say," You know what? This morning, we posed the question, 'If you could change one thing on your body, what would it be?'" We got some really good calls. I said, "Personally, I don't know where I'd start!" The guy I work with said, "It's a family friendly show." I said, "I'm not talking to you about it. Let's go to the phones!" We had several calls this morning, so we saved one of them to make it sound like we're taking one this afternoon. And the woman said whatever it was. It might have been, her shoe size or skin or something. It sounds very live when we put it all together. And it's fresh. It may refer to something we did. But it's a new bit. BB: Incidentally, for me it would be my hair because the older I get the crazier it gets. DS: [chuckles] You have lots of hair, though. Be happy! BB: I am. I'm 45 and I have this full head of hair. DS: My guy is the same age as me, and he has this full head of hair. And, same with you, it's dusted with gray, and I don't mean that offensively. I think it's great about my boyfriend because I love hair. 8. You have had an opportunity to meet many well known recording artists. Which one or ones surprised you the most? DS: I met Johnny Cash. BB: Oh, my God! Really? DS: I knew you'd say that! You sound like my boyfriend. To be honest, Reba McIntyre was in town and Johnny Cash was here. June Carter was with him. Maybe Clint Black; I'm not sure. I can't remember who the third was. We were all backstage, and I was totally thrilled to be meeting Reba. She had the long, red hair then. She was pretty hot. BB: She's pretty hot now. DS: [chuckles] I meant hot as in hot stuff. That's ok. You're a guy. Anyway, I was quite anxious to get a picture with Reba. This guy comes up to me, who is Johnny Cash and says, "Excuse me, miss? " He knew I was the jock. "Do you want a picture?" I'm going, "Welllll, ok!" Because, back then, Johnny Cash wasn't as big as he has been since the movie "Walk the Line". I think that a lot of younger people especially got into him, but at that point, things had settle down for him. It wasn't like he was putting new stuff out. I go, "Ok, sure." So, I got my picture taken with him. I thought it was pretty nice of him to do that. But I met Reba, so I was quite surprised that Johnny had offered that because he is a big star. But to me, at that time, being in the country, it was Reba who had the hit records. Johnny was sort of before my time. As time went on and the movie came out (Walk the Line), and people like my daughters were going through a photo album one day and [say], "Mom, there's you with Johnny Cash!" I [reply], "Yeah. " They say, "Oh, my God. Our mom had her picture taken with Johnny Cash! Do you see this?" I'm thinking, "Why is that so special?" But there I am with Reba and Clint Black, and pointing out all this stuff. "But that's Johnny Cash! ", they're saying. So that really surprised me that he was such a gentleman to offer that and he wasn't conceited or mean or anything. He was just a really nice guy. So, that certainly shocked me. When I first met my boyfriend, I was telling him this story, and he had the same response as you. I said, "I met Johnny Cash", and he said, "Wait a minute. You met Johnny Cash?" "Yes. I had my picture taken with him?" "You have a picture of yourself with Johnny Cash?" DS: I can. He scanned a bunch of pictures. Anyway, he goes, "Oh, my God. I have to see that picture. " I said, "I don't even know where it is. It's in some photo album somewhere at home." I was a little embarrassed to get it to him because it was me with Johnny Cash and my ex-husband. DS: Anyway, in the end I did get the picture to my boyfriend. He cut my ex off and enlarged the picture and he kept one and gave me one. Then, he gave it to my kids for Christmas with their mom and dad both in it, which I thought was very tasteful. To this day, he has it on the mantle piece in his house. People will come in and say, "That's Denyse and Johnny Cash!" He'll say, "Yeah! And she didn't even ask for it! Johnny offered it to her." I guess that was a pretty big deal. DS: I will try to send that to you. DS: As far as Garth Brooks: Really nice guy. Introducing him to winners that had won the opportunity to meet him. He sat down and talked to me about my kids. He had, at the time, I think three. I had four. His birthday was February 7th, and mine is on February 14th. We're both the same age. On top of that, he goes, "Can I get you anything? Can I get you a spring water or something?" I'm thinking, "Garth Brooks just offered me a spring water!" I didn't say it, but I'm thinking, "Oh, this will go down in history. I'll tell this story for the rest of my life." He gets up, walks across the room and gets a spring water and brings it over, which I thought was pretty damn down to earth and pretty cool. BB: Did you drink it? DS: Drink it? I held on to it all night! Are you kidding me? I'm trying to think. I have met lots of others, but those two stories kind of stood out to me. BB: Do you have a picture of yourself with Garth Brooks? DS: I would have one somewheres, but I don't know where that is. I know I would have got one. It might even still be at the radio station. There's all kinds of them floating around. But I'll try to gather up what I can for you. I have Sawyer Brown. I have Nitty Gritty Dirt Band. I look younger in some of these because some of these were taken close to 20 years ago. I remember the Dirt Band. They were just totally in love with me. "The D.J. We have to take her with us!" They were hugging me. They were so fun. And Sawyer Brown was the same way. I did not meet Tanya Tucker when she was in town. I met Clint Black. I met Reba. I met Johnny. I met Travis Tritt. He's fantastic. BB: I like Travis Tritt. DS: Tim McGraw. Terry Clark. The pictures; where are they? That's the thing. They're home somewhere. I'm not one to display pictures because I'm kind of shy about stuff like that. I met Alabama couple of times. Loved Alabama. George Canyon of course has co-hosted the show. I know George well enough to sit down and chat with him. I wouldn't call him a friend, but he's certainly an acquaintance. 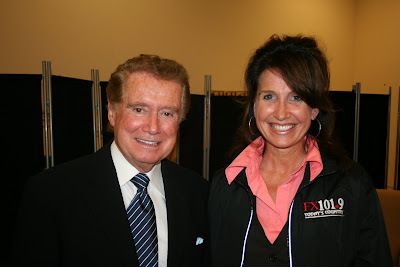 BB: Regis was on your show?! I knew he was in town last year. DS: Regis called me up from New York, did a little blurb with me before he came to town, and then I went back stage to meet him, the Friday night of the Casino. He was totally just a sweetheart. "Oh, your show's the country breakfast! I would love to come in and have breakfast with you!" He was really sweet, and a really funny guy. BB: Do you have a picture of yourself with Regis? DS: I do. It's huge. I've got that in my e-mail. I would have quite a few actually in my e-mails, yes. I'll send that to you. That's quite a good one, too. I met Michelle Wright. I actually introduced Michelle Wright on stage at the Musqoudoboit Valley Bi-Centennial Theatre before she hit it big. BB: A long time ago I had a crush on Carroll Baker. DS: Carroll Baker? Yes. I don't think I ever met Carroll. [I met] Sammy Kershaw and Lorrie Morgan. BB: Yes. They're divorced now, I think. DS: Yes, but they're back together now, I think. DS: Oh, no kidding! And, she's so tiny. And Shania? I sat right beside Shania. She had a ball cap on. She had diamond earrings on about that big [huge!!] . I'll never forget it, because Daryl Goode, who works with me, goes, "You see the big diamond earrings and the ball cap? " And she was just sweet. She was there with Ricky VanShelton. I met him. But she came into my studio and sat down right beside me. That was just after she had married Mutt [Lange]. She was on the "Woman in Me" tour. She was in Halifax and opened for Ricky Van Shelton. And then she came on a promotional tour, and that's when I met her. And the next time she came back she only came as far as Moncton, and I didn't see her up close in Moncton, but I went and watched the show. She was fantastic. She's just little. She's just tiny. And just a beautiful woman. Faith Hill. I have a suede belt that she signed: "Faith Hill" on one side, and Alan Jackson signed it on the other side. BB: My mother loves Alan Jackson! DS: I was actually going to try and sell the belt on ebay because I thought, "These are authentic signatures. ", and it was sort of a light, pale green suede. He signs "Alan Jackson", and she signs, "Faith Hill". That was pretty cool, and that was before she married Tim. That was when she opened for Alan Jackson. So, there's a couple of pretty big stars. And she was sweet. It was right after she had throat surgery. And Robert Pace's wife was backstage with us. Louise says, "How are you feeling? How is your throat?" She said, "Thank you so much for asking. I feel fantastic." Isn't that cool? She was sweet. Alan is sweet. Alan is a big, tall guy. He comes across as very shy, quiet. He comes across as not very fluent in conversation, but I think he's just shy. He didn't have a lot to say. I remember Travis Tritt. He was in a deerskin outfit. I remember saying, "Oh, I love your outfit!" "Well, I like yours, too! ", he said. [chuckles] He was really sweet. He came in on a big Harley on stage. I met Wynona. She came in on a Harley on stage. It's funny. I never even thought about it [the people I've met] until you picked my brain. I'll try to find you as many pictures as I can. BB: Thanks! I'd love that. 9. I will provide the names of people you know. Please say something about them. DS: The greatest guy in the world. A real sweetheart. I love him to death. A hard worker. Great jock. Under rated, I feel, and I mean that in a complimentary way. A family man. I can say nothing bad about Ian. I have nothing but good things to say. I worked with him very closely, and I would consider him a really good friend. BB: He is promoting my blog like crazy. On his facebook, he has a special link to my interview [with him]. DS: He is a very giving guy. He is so "Mister Radio", but not in a bad way. He is so dedicated to the industry. I really feel that in all of his radio career he has given it all that he's got. I wish that I could have worked with him, co-hosting at FX 101.9. I think that we could have done well together. I really like Ian. BB: I'd love to see him to a radio show full time. BB: He says he is always the bride's maid, and never the bride. DS: I know. It's unfortunate because he is such a nice guy. I just think he is totally under rated. He is like the singer that doesn't get the record deal, like the local singer that never hits it big. But, great guy. Great guy. DS: My first boss. I remember saying to him, "Do you know that you gave me my first job ever in radio? Do you remember that?" I said that to him in the last couple of years. He looked at me with that stern, fatherly look, and he said, "It's the best thing I ever did in my life"
BB: Oh, my God! That's pretty classy. DS: That's a huge compliment. And, I remember Frank magazine at one point (and they're mostly very favourable to me) printed some little editorial from somebody in the back [of an issue]. It was really mean. And, MIke Cranston wrote Frank Magazine, and said, "Never in my life have I ever responded to one of your editorials, one of your articles. But I have to address the troll who was critical of my co-host Denyse Sibley." He went on to rip that person apart for not identifying themselves and to be so small-minded and jealous and cruel. They criticized my dress, my hair, my broadcasting abilities. I was just the scum of the earth, according to this person. And Mike Cranston made them realize that by not identifying themselves and by attacking me that they were actually the scum of the earth. I kept the letter. It was a huge compliment to me that someone of his caliber [would defend me], because he's a Hell of a broadcaster. He's got the ballsy voice. He's a hard worker. I've known him since I was 18 years old. And he gave me my first job ever. And he also gave my daughter, Corinne, a job i n broadcasting. Last Summer, he hired her as a part-time for the Maritime News Network when she needed a job. Based on the fact that she was my daughter, and he believed in me, he gave her a chance. She's not even a broadcaster. She's a university graduate, and going on with her Masters and going on to teaching and so on. But she needed a good paying, part-time summer job, and he made sure she got it. He's a really nice man. His wife, Linda, is a wonderful person. They're very, very good friends of mine. They really like my boyfriend. They love my kids. They're always there for me. If I needed anything, I could ask Mike and Linda for it. As a team, they would be there for me. I have nothing but good things to say about him. BB: Is he one of the people you missed the most when you left FX 101.9? DS: Absolutely, absolutely. I kept in touch with him. I called him frequently. I never tuned back to the radio station, but there were certain people that I stayed in touch with, that I would call, ask how they were doing. If I came to town, I would see them. I would come in and visit Mike, but I had no interest in schmoozing the other people. I wanted to see these certain people, and he was one of them. He's a good guy. DS: Bill was my co-worker. He became my co-host. Love him to death. The biggest goof ball in the world. I say this with affection. He was a child in a man's body, and he would laugh to hear that because he would agree. How do I describe Bill? Well, I'll give you an example of working with Bill. He was great for show prep because you didn't need any. Bill would run out of gas on the bridge and call me and say, "Can you send your daughter over your car and some gas because I just ran out on the bridge, and I'm gonna be late for work." I'd say, "Are you kidding me? My daughter is working. You're supposed to put gas in your car, you numbskull!" [chuckles] He goes, "I'm gonna be late" I say, "That is so you." Anyway, we worked together for a brief time. I certainly did not leave FX because of Bill. I love Bill to death. But I can tell you that he left because I left, and that was a huge compliment. BB: Changing subjects a little bit, you have always worked with a man. Why not have two women on the morning show? Have they considered that? DS: I don't know. I think they want the dynamic of a man/woman because I think it might be too much, maybe to have two women. I think maybe they could pull it off if you integrated Daryl [Goode] into the show more. But, it's harder because when I worked in Truro after Tim left it was Mandy and I. Some of the comments... they weren't negative, but do we need two women? Because then everything is from the female perspective. Whereas we like to play that man/woman opposite thing. The housewife versus the husband sort of thing. They might do two women if they have a man full-time too, but I don't think they would do that. DS: And you don't have an issue with it. DS: And I wouldn't have an issue working with another woman, or with another man, and I've worked with a lot of difficult people over the years. But I never, ever fought with anybody or anything like that. It would never happen. I've always been in a secondary position, more-or-less, so now I'm in a lead role. But when it's reversed it's really tough. I have the one guy who works with me for about two hours, my producer. That works well, but again, I'm totally putting everything together. He's editing stuff that we've got off the phone. He's putting clips together. He interacts with me for that couple of hours, which you need. It's really hard to do it by yourself. BB: Joe Leary did it by himself. It must have been really hard. DS: Yes. Who laughs with you? You get the odd contestant that's great, and you get some feedback back and forth, but they're not there every day. You might have a deadbeat listener the next day. That's no fun. You need that person with some personality in there. So, for the time being, it's my producer and me. I asked for him to join me because when I came back I had no one, and I needed help. I operate the board, but I can't operate the board and do the cool edit and do the voxpro. The first few days I was back, the calls were incredible, and they wanted that on the air. I set it up to record on this side, but he takes it from there, and puts it together and puts the soundbite together and so on. I couldn't do it all, especially on a busy day when you get school cancellations, and traffic and stuff. It's just crazy. So, when I said, "Can he come in and work with me?" They said yes. I said, "Well, can I bring him on the air?" They agreed to let me do that to a minimum. And, now, he's sort of more involved in that. He's getting to be a personality. We came up with Jigger because it's sort of Newfoundland. So, yes, I can honestly say I have had 3 negative e-mails about him. Didn't like him. Some were saying, "I've got to warm up to him." Now, they love him. They just love him. They've accepted him. Those that don't like him, will never like him. BB: What's Bill Hart doing now? DS: He is in Kingston. He does some on air, but he's basically music director, being trained for program director. He's more administrative, I think. He still does on air, but more administrative. BB: This is a world-wide blog, so tell me what station it is, and I'll mention it on the blog. DS: I don't know. It's Rogers, and it's country. Go to facebook, and you'll find it on there. DS: Great guy. Big teddy bear. I just had a conversation with him a couple of weeks ago. Good sport. I tell this to everybody that says, "Do you know Frank Cameron?" , because Frank's a pretty famous guy. Especially with his weather gig with Doug Saunders. He's certainly been in plenty of magazines, his Bandstand, and all that. He's known for his CBC stint. So, when I say I know Frank Cameron, they go, "You know Frank Cameron? What do you think of Frank Cameron?" And I would say, "Do you know what? If I called Frank up right now and said, 'Frank? My car broke down. I need a drive home. He'd go, "Just a second, 'Nyse. I'll get my keys." ' That's the kind of guy Frank Cameron is." DS: There you go. In all the years I have known Frank, I've never seen him in a bad mood. I have never, ever seen him raise his voice. He always had a smile for me. He was always very kind to me. If I said, "Frank, I don't have any money." ( I would never do this. ) Frank would say, "'How much do you need, 'Nyse?" That's the kind of guy he was. A very nice wife. We had done some escorted trips for Country 101 at the time. He did them for CHNS. And we combined them one year, so I got to travel away with him and see him up close, not shaven, with a cowboy straw hat on, on the beach. And, you know what? He is the same guy everywhere. And the people that love him, really love him. And I'm one of those. DS: I didn't know him when he was in the Valley. But he took the same course as me. He was doing mornings when I was going to Kings Tech. BB: I listened to him on mornings. That was before I knew him. And then, when I was working at Country 101, he came on board as the program director for 96 CHNS. BB: That was 1988, I think. DS: It could be. I don't know; it was a couple of kids ago. I only had a couple of kids then. I would have had Nicholas then when he [Moe] was in the reins. As the program director for 96 CHNS, he also looked after the traffic for both CHNS and CHFX. I used to do that for both of the stations. He became my boss for that. But I also did shifts for FX, and I had another boss for that. [Moe] was my boss, but I never had any problems with Morrissey. I found him very funny, and a good jock. And, then, he left, and showed up in Truro at Big Dog. And, then, I showed up in Truro this past year. We were working side-by-side as equals. He's doing a morning show on Big Dog. Through the window, I'm doing a morning show at Cat Country. I thought, "Isn't this ironic? You used to be my boss! And, now, we're both doing a morning show." I never thought, when I started in broadcasting, that I would ever be in the performance end of it; and do one by myself, and do one across the window from Morrissey Dunn. That's pretty cool! Morrissey and I are good friends. We still chat back and forth on the phone. I don't see him a lot, but I do talk to him on the phone occasionally. BB: He's on my list to be interviewed. DS: Is he? He's a good guy. A hard worker. I like him. BB: We'll probably have lunch at the Big Stop in Truro. DS: Big Stop Irving? Good choice. DS: He worked part-time at MBS with us. I just liked him. Funny guy. Good looking guy. He got a great gig. When he was with Maritime Broadcasting System, he worked part-time with me in Halifax, and went on full-time in St. John, New Brunswick. We're all kind of connected colleagues. I've got a lot of respect for Jeff. As I said, he's very, very funny. I don't know a lot about him. I know he's married. He lives in Halifax. He's really good friends with Tony [Smith]. And, we're interconnected through work. I do believe that Jeff might have played ball with my boyfriend now. They're both from Sackville, New Brunswick. I think they know each other. When I see Jeff, it's like meeting a really good friend. BB: How about this, then? You're both doing morning shows. BB: But at the same time you're competitors in a sense. DS: Not really. I don't think so. BB: You're fighting for market share if nothing else. DS: Yes. We're fighting for market share, but he's fighting a whole different audience than I am. A whole different audience. I remember asking him why, when he was coming back to Halifax, he didn't try to do a morning show with me, because I thought we would have done well together. He goes, "Because I don't like country, Denyse. Nothing personal!" He went to... what do you call Z103? What kind of format? DS: I would never work a hip hop format. It would just never suit me. And I always wanted to work Country, and that's where I am. So, I don't think of us as competitors. I think of us as friends. I really do. If I was at an event, I would never think that I needed to upstage him, nor him, me. We do things like "Blind date with the Stars" together, where you have a whole list of "local celebrities". He would be at one table. I would be at another table. But it's like, "Jeff! Denyse!" A big hug, and that sort of thing. I would never think, "Oh, he's competition." I don't think of it that way. I think of it seeing him out somewhere and, "You look great. Good to see you". I don't think of us as competition. We both doing morning shows, and we're both competing for our market, but he's going in a whole different direction than I am. That's how I look at that. But he's a really fun guy. 10. If you were running a radio station, what type of format would you program and why? DS: 100, 200 percent Country! First of all, I love it. Secondly, I love it because it tells a story. A lot of people make fun of that "dog died", "woman left me" sort of thing, but I look at it as that a lot of it is a really nice story. It has a beginning, a middle, and an end. BB: You can make out the words. DS: You can make out the words! I just think there's always a place for Country music. I'm a believer in Country. I defend it. I often will meet people who will say to me, "Oh, you are Country! Blah! I don't listen to Country music. " I'll go, "Really? Is that true? You don't listen to Country?" "No, I don't. But, I remember growing up, and my dad used to listen to Johnny Cash. I like Johnny Cash." "Oh, yeah, right. You don't like Country, but you like Johnny Cash?" Then they say something li ke, "But that Kenny Chesney guy. You know, that bald guy. I like him. " "Oh, but then you don't like Country. Right. I got that." "And, who could not love Faith Hill? I mean, really! She's gorgeous!" "I know. And you don't like Country! And what about Shania? You ever heard of her?" "Oh, yeah. Who hasn't heard of Shania?" "But, darn. You don't like Country. Isn't that interesting? " And then they kind of look at you and go, "I know what you just did!" I just made you realize that you do like Country. You don't like it all. But neither do I. I don't like all the old rock n' roll. But I like some of it. So, would I say: I don't like rock n' roll? Uh huh. I'd say, "Ah, I like rock n' roll. Although some of it..."
And, so, I feel that country always has a place, and feel that people my age and younger really love it because they grew up with that old style Country. And then they have to get over the hurdle that the new style of Country is almost like a popular [style] of music. You mix it in with that old style of Country so you get people like the George Straits, the Kenny Chesney's, and all of a sudden there's this whole big spectrum of music which goes from the Tammy Wynette's and Loretta Lynn's and the Johnny Cash's, into what we play today. And then you've got the mixture, like the Alabama's and that. So, I think there's always a place for it. I think it will always be my goal to get rid of that stereotype. I'll always support it a 100% because I think it's fantastic music. BB: On your show in the morning, to what extent do you control what you play? BB: Because that's the m.d's job, and the program director's job? DS: That's right. That's why we have a music director. That's why we have a program director. Everything is put in the Scotts system for me. I can jig it around a bit for timing. If someone requests something and I think it's a good story behind it, I may delete or add something; but I just can't do that at my leisure. That's why someone programs it. It follows a certain format, a certain... what's the word I'm looking for? It comes up in a rotation: Power Gold, Today's, that sort of thing. I don't have the authority to change that. Plus, we have to do so much Canadian, so much non-hit. I just don't mess with that. I don't know what those rules are. That's not the end of the business I want to know. I want to know the end that I'm involved in. BB: If you were at home listening to Country music, you wouldn't be straying too much from what you play every morning? BB: So, you're pretty happy with the [musical] content of your show? DS: I've tried to really broaden my horizons to music. It's mainly because the guy I go out with is a big music fan. He teases me about Country just because he knows it gets on my nerves. But he really does love Country. He loves the Johnny Cash's. He is more interested in the old style like Hank Sr., Hank Jr. style stuff, whereas I am a little more into the Kenny Chesney's, the Tim McGraw's. I like some of that [the older] stuff, but I also really like this stuff. So to sit back and listen at home, I'll put John Fogarty in, but then I'll put Kenny Chesney in, and I'll play them over and over again. And then I'll all of a sudden I'll put Brooks and Dunn in. And then I might put Alicia Keys in. BB: Alicia Keys? You like Alicia Keys? DS: I really like Rod Stewart. I like Bob Seger. I really like Alabama. I've really tried not to be too narrow minded about [music]. I don't like rap music; I find that irritating. Hip hop gets on my nerves. That sort of bang, bang, bang, bang. I like all of the Country, but there's some in all of it that I don't like. I like Barry Manilow. I'll play Barry Manilow over and over again. BB: Some people used to tell me I looked like Barry Manilow. DS: You do, sort of! But your nose is much smaller. DS: It's much smaller, yes. I would never say that [my nose was big]. But the hair, maybe. If you saw my collection of cd's, you'd go, "Wow!" And my boyfriend tries to influence me into listening to other things, too. He'll make me listen to Duffy. You ever heard of Duffy? BB: I love her album. "Mercy" -- I love that song. DS: So do I. But in Sweden it was played over and over again on the radio. He heard it and said, "Oh, wow! I have to get this." So, he bought it and made me listen to it, and I thought, "This is fantastic." Yet my 17-year-old son loves it. So, that's odd for us to love the same music. "Oh, my God. Mom's listening to the same stuff as us!" You just try not to be too narrow-minded, but I just can't go with rap. And I don't like hip hop. I know the tanning bed I went to before I went to Cuba with our listeners just constantly played The Bounce and Z103. The announcer mid-day (I don't know who she is or anything, and she wasn't a bad announcer) was screaming and yelling and "The Bounce, bounce, bounce". I'm laying in the tanning bed thinking, "I just want to go to sleep. Can't you put some Kenny Chesney on or something? I'm a huge Kenny Chessney fan. Can't you just put on 'The Woman In Me' and let me lay there and listen to it?" BB: Who's Nicole Kidman married to? BB: You go to his show last year? DS: Yes! And he called me and I did an interview with him. BB: Do you have a picture of you two together? DS: No, I don't have a picture of us together. I didn't go back stage because that was the day I was shooting my commercial. So, I was really, really busy running around and shaking hands and making friends and kissing babies and giving away money. It was my first big weekend back in the city. I was pre-occupied getting footage for our commercial. One of the clips in the commercial -- it's surprising actually because they filmed for hours -- but there's one little clip of that. It's me giving a guy $100 at the concert. It was $101.90! So, yeah, I didn't get back stage because I was preoccupied, but I have a nice interview with him. He called me sweetheart, so I can handle that! "Thank you, sweetheart" he said, in that Australian voice. But he's great. I think he should leave Nicole and come to me. [chuckles]. Off the record. BB: Oh, darn. I wanted to leave that in! DS: You can. Just kidding! BB: Well, Denyse, thank you so much for your time. This has been a great delight to meet you. I wasn't sure what to expect. Ian said I must interview you, and I said, "I would love to meet her and talk to her." This has been a wonderful experience, so I thank you for your time. DS: Thank you very much. BB: And, uh, spread the word of the blog. BB: Tell everybody you know, and we'll go from there. DS: The word of the blog! Bevboysblog.com! That's a tongue twister. I should use that in one of my contests! Say it five times. Would you like me to do that? DS: I will do that. Yes! BB: You tell me what day and I promise I'll tune in. DS: I'll do that. I'll say, "You know what? I sat down and I had this fantastic interview". We'll do tongue twisters! That's exactly what we'll do! Best interview so far my friend!! How are you going to top it. She has a very engaging personality that translates well in word. Well done. Thanks, Reg. Appreciate the kind words. I have already interviewed the next person. Transcription will take a while. This next guy will be especially compelling to you, Reg, because it's a guy we grew up listening to!! Lots of 1970's and 1980's Annapolis Valley Radio Stuff. Tell everyone you know about the blog!! Thanks, AJ. That means a lot to me. 779th Post - Coming Down! 776th Post - A Tip of the Hat to the CBC! 773rd Post - Larry King Was Wrong! 763rd Post - A Pretty Cool Day! 760th Post - Anybody Here Watch Fringe? 758th Post - Who Has the Time? 757th Post - A Christmas Post Eight Months Early! 756th Post - Damn It, Chloe! 748th Post - So, Did You Listen?